Love kids, love teaching, love anything Disney, and love animals. 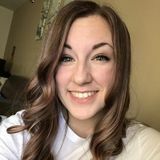 Want to connect with Kirsten? Hi! My name is Kirsten DeHaven. I would like to provide care for children or help out families who have children to gain experience for my degree and also to get to know a family in the community while I am in college. I am a junior studying Elementary Education, so homework help is something I look forward to. I've had an abundance of experience working with kids, and they make me happier than anything. I have notifications turned on, so please message me whenever!